Ansel Adams doesn’t need an introduction. Even non-photographers know about his awesomeness. He wasn’t just a master at making amazing images though–he also played a very large role in the preservation of the American wilderness. Well, about a month ago a new book was published with a few hundred of his photographs that were taken in the national parks of the United States. I finally got a chance to look through the book, so I thought I’d share some of my thoughts. The book contains over 200 hundred photographs, and many of them have never been published before. It’s the most complete collection of Ansel Adams photos from the national parks of the United States. Throughout the book, there are also a few quotes, stories, and excellent commentary about some of Ansel Adams’ techniques. These stories appear about once every ten pages or so. At the end of the book, there’s a couple of excellent essays about Adams’ passion for the American wilderness, and his dedication to preserving that wilderness. This is probably the only photography book where you’ll start learning things before you even open the book. 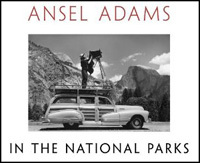 On the cover, there’s a photo of Ansel Adams standing on top of his car with his camera all setup on a tripod. At first, it might look like Adams was just trying to be funny, but this is actually a technique he used a lot to help get a better overlook of a busy foreground. I’ve always felt that one of the best ways to learn more about photography is to just look through tons of images, and especially images taken of areas you’re familiar with. Not only does this process inspire you, but it also helps you see as the camera sees. Well, this book of photos by Ansel Adams is perfect for that. Yeah, maybe the photos don’t each contain a detailed story about how the image was made, but just looking at these images is enough to inspire you and get you thinking about how the image was made. At first I thought this would be a book I would only look through once and then be done with it, but after going through it and staring at these images (and admiring the excellent print quality), I’m certain I’ll be picking up this book very often for inspiration. Every time I look at an image by Ansel Adams, I find something new or find a new reason to admire his passion for photography. Overall, I think this is an excellent book that any nature photographer (even non-landscape photographers) can learn from. Help support PhotoNaturalist and buy the book through our affiliate link! If you’d like to buy the book, I’d greatly appreciate it if you used the Amazon link below. I get a small commission for each sale, which helps support this website so I can keep writing more articles. Thanks! P.S. Please know that I do not recommend something unless I personally think it’s totally awesome. For every book I rave about here on PhotoNaturalist, there’s about ten that I didn’t find good enough to recommend. Thanks for the heads up on this book. I have been planning on adding an Ansel Adams book to my “library” but with so many to choose from, I didn’t know where to start. Now I do. Thanks! Michael – I’d also highly recommend The Camera. It’s one of his excellent instructional books, and one I re-read and refer to over and over again.. in fact it’s starting to get a little beat up cause I use it so often. Ansel Adams in the National Parks was delivered to my door yesterday. It was part of an order of 8 books so I haven’t had a chance to open it yet. Looking forward to it when time allows.